Sometimes the most subtle elements make the best pictures. 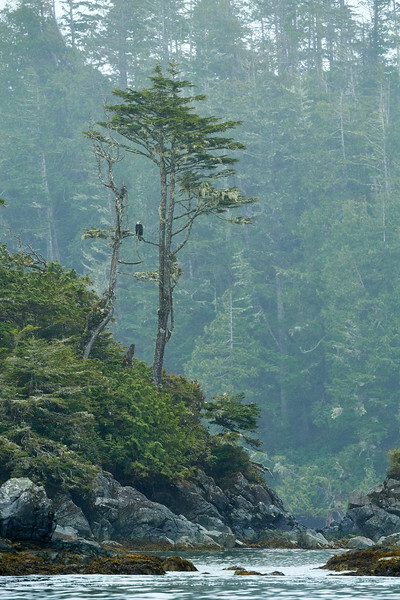 We just finished shooting a large group of Seal Lions and were cruising the coast in our zodiac for Sea Otters when we found this bird perched in a tree. Normally, this wouldn’t be all that compelling an image. But, the combination of the terrain which includes the little sound below the bird’s perch, the whole scene seemed much greater than its individual parts. Another key element in this image is the far background of trees. Without them, the grey sky would over-power the image. To keep everything in proportion, the only way to make this image was to shoot it from a distance. That way the bird’s perch would stay in front of the green background--no grey sky. But, not so far that the bird becomes unrecognizable. We made a couple of passes at this scene with out zodiac allowing us to try lots of different compositions. Considerations included where to place the pathway of the water at the bottom--put it in the middle or offset at a power position (I settled on the power position). Also, there’s an annoying branch that’s just about the bird’s head that if we were positioned a little further left would resulted in no images without the branch blocking the bird’s head. I decided on the vertical format because the tall trees lend to this being the best compositional compromise. I did try many horizontal compositions but didn’t like them nearly as much as this particular one. Of course, the only way to make all these choices in quick succession without moving the zodiac around too much is using a zoom. The Nikkor 180-400mm f/4 is fantastic in this respect. Not only is the zoom a phenomenal feature, being tact-sharp at almost any f-stop and focal length is really important. I shot at f/8 for depth of field purposes which seemed to work in this particular case.